About 90 elderly South Koreans have been reunited with the North Korean relatives they have been separated from for more than six decades, since the war that split the peninsula in two. The relatives shared tearful embraces Monday in North Korea's Mount Kumgang tourist resort, hours after a convoy of buses crossed the border from the South. Over three days, the participants will have six face-to-face meetings with their North Korean relatives — under the watchful eyes of North Korean agents. Another round of reunions, to be held Friday to Sunday, will involve more than 300 other South Koreans, according to Seoul's Unification Ministry. Some 20,000 people have participated in 20 reunions since 2000, the last one taking place in October 2015. Millions of Korean families were divided by the 1950-'53 Korean War. After more than 60 years of separation, many of those waiting to be reunited with their loved ones have died. Most of those surviving are over 80 years of age. 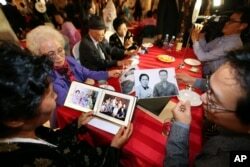 Family members from South Korea and North Korea show their family photos each others during the Separated Family Reunion Meeting at the Diamond Mountain resort in North Korea, Oct. 24, 2015. South Korea sees the separated families as the largest humanitarian issue created by the Korean War. The Unification Ministry estimates there are about 600,000 to 700,000 South Koreans with relatives in North Korea. South Korean President Moon Jae-in on Monday reiterated that time is running out to expand the reunion program, saying it would be a "shameful thing'' for both Koreas to see many elderly people dying without even finding out whether their loved ones are still alive. The United Nations Secretary-General Antonio Guterres welcomed the news of the reunions Monday and urged the two sides to make such events "routine and include many more people, including affected Koreans worldwide, allow participants to meet privately, and to remain in contact after the meetings." Among those most desperate to reconnect with family are Korean-Americans who have never been included in the reunion process. Chahee Stanfield, the executive director of the National Coalition of Divided Families, told VOA that in 2001, there were 100,000 Korean-Americans with divided families living in the U.S. "But most of them have passed away," Stanfield said. Stanfield said the Korean-American community had high hopes for the summit between U.S. President Donald Trump and North Korean leader Kim Jong Un in June. She said the community felt that was their "last chance for the reunion." "We prayed for the summit with our whole hearts," she said. But "it all turned out to be about the remains of the [American] soldiers, which is also very important, but it was never about us." Stanfield said after the summit, U.S. officials asked the South Koreans to include the Korean-Americans in the negotiations. South Korean officials tried to have Korean-American families included in Monday's reunion, but Pyongyang rejected the notion. "We just don't know what's going on ... we don't even know where we stand now," she said.